In one of my earlier posts I have already referred to the excellent blog of the journal humanity, which was founded in October 2010 by Sam Moyn, Columbia University, New York. We have now decided to link more closely both blogs by cross-posting various contributions from time to time. Our aim is to reach out to the readers of both blogs and to intensive networking in the research field of the history of humanitarianism and human rights. Enjoy discovering the various contributions! 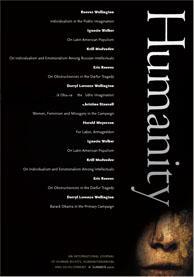 This entry was posted in Journals, Networks, Posts and tagged Human Rights, Humanitarianism, Humanity by Fabian Klose. Bookmark the permalink.